It has been a hot summer in Zehland. Nina has found a floating tea light candle holder and is enjoying the pool from the middle of its waterlily cup. A little butterfly has stopped by for a visit, perhaps thinking the flower is real. 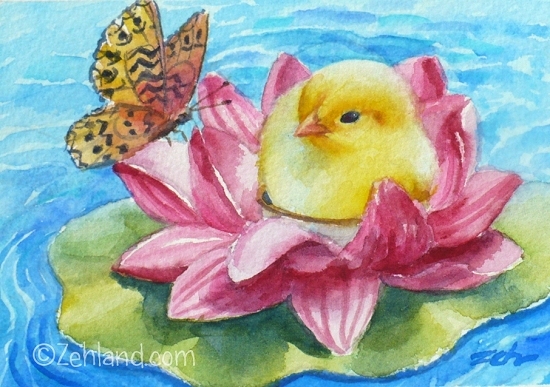 Nina's Waterlily Float fine art print is for sale in the Zehland Etsy shop. 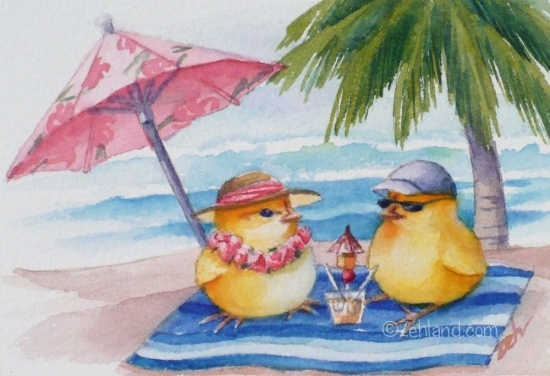 It's been a great day at the beach and now Ferdinand and Nina are going to do a bit of shopping. Here they are waiting for the trolley to the Ala Moana mall. 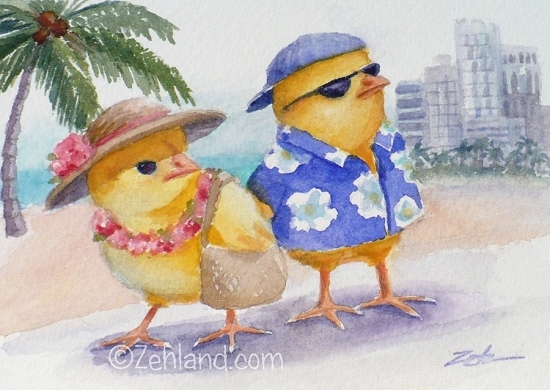 You've got to watch out for Ferdinand and Nina, those adventurous Zehland chicks. You never know where they will turn up next. Here they are on a tropical Waikiki beach in sunny Honolulu with what l thought was a Mai Tai, but they tell me it's Coco Mist. Hope there's no rum in there! Below is the recipe WITH rum (adults only - for children, just leave it out or use 1/2 tsp. rum flavoring) courtesy of Beth of Gemworks by Beth on Etsy. 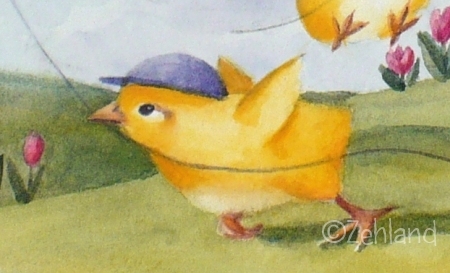 Little Georgia was hopping among the crocus one fine Spring day when all of a sudden, she came beak to nose with a brown bunny. 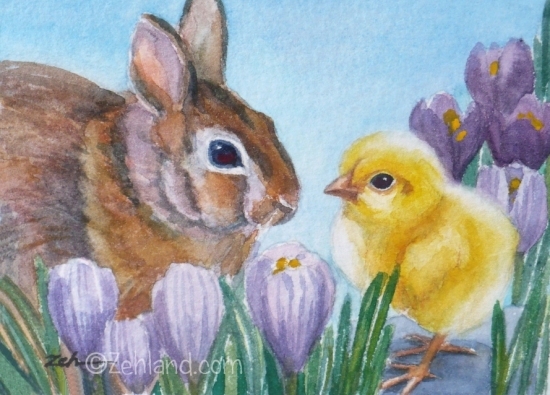 "And a very fine day to you," answered the cottontail. "Where are you going on this lovely day?" "Just wandering and looking at all the beautiful flowers," replied Georgia. "It's a perfect day for flowers!" "May I join you?" asked the bunny. "My name is Emmy. Emmy Fluffentail. I like flowers too." So off they went. And never a finer day was had by two new friends. Georgia and Emmy Fluffentail fine art print is available in the Zehland Etsy shop. Whee! It's March! 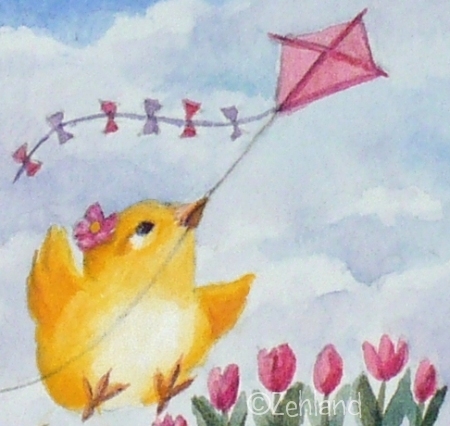 And you know what that means...Spring breezes and kite flying. Nina has her favorite color - pink. She might be in danger of being carried right away. Hold in tight, Nina! Ferdinand is running to give his kite some help - and hoping it will pull him right up in the air too. 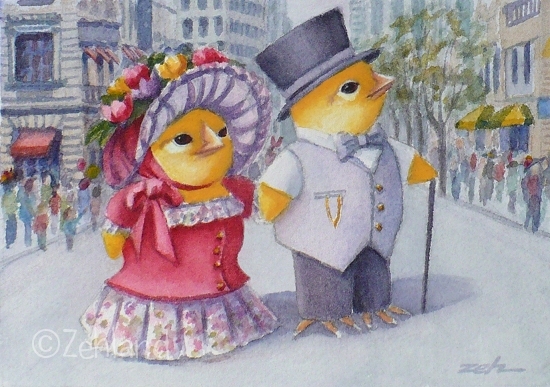 To help celebrate Easter, the annual Easter Parade & Easter Bonnet Festival is held every year on 5th Avenue in New York City. Guess where our two friends are? 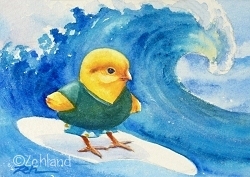 Ferdinand spent some time practicing his surfing skills while on vacation in Hawaii. In case you're not a surfer, he's happy to show you how it's done in the video below! All Zehland images and stories are copyrighted. This means permission is needed to copy them. Read More about U.S. copyright law. 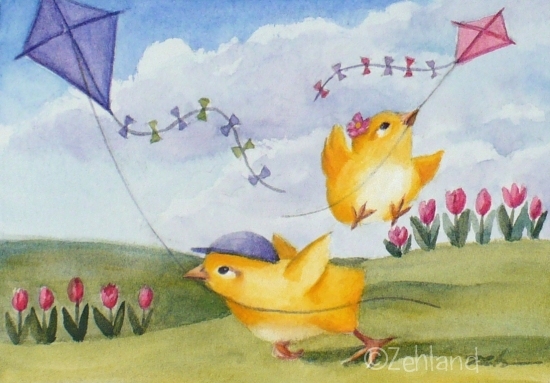 When something new happens in Zehland, Ferdinand and Nina will let you know on the Zehland Facebook page. They'd love to see you there! All Images and Content Copyright © Janet Zeh 2016. Powered by Blogger.